You know Jake and I are all about a bargain. I'd been hearing about Hi-Tone's pizza night for some time. My friend Kate works there and is always putting it on her facebook status. But it wasn't until I got the visual of this pizza via my favorite Memphis restaurant blog Dining with Monkeys that I felt that I MUST go. So Tuesday night, we decided to head on over to Hi-Tone to try this pizza special. 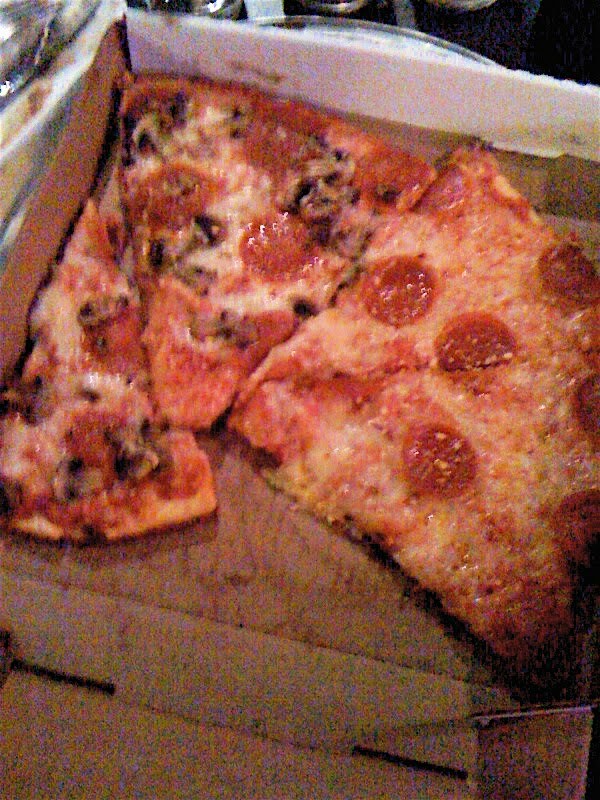 It is half off your pizza and they serve New York Style pizza (my fav). They've got all sorts of specialty pizzas (Italian, BBQ, Hot Wing, etc). We invited our friends Heather and Ed and were going to meet up about 7. Well as we were driving over, we realized that we were going to hit a bit of traffic because there were about 20,000 people letting out of the zoo (free Tuesday + MCS spring break, can't blame them) and so by the time we made the usually 2.5 minute drive to Hi-Tone in 10 minutes, I was ravenous. So what did we do? Order hummus! I happen to really love hummus and find myself very picky when it comes to hummus. Two of my faves in Knoxville (Tomato Head and Barley's) both had amazing hummus and I haven't found just the right thing here in Memphis. 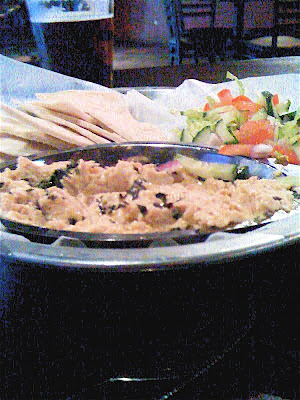 So imagine my surprise when this litle hole in the wall bar on Poplar has some of the best hummus I've ever tasted - and a plate of it, veggies, and pitas were only $3! That's what I'm saying. I'm going back for the hummus. Well after fighting the throngs of people, Heather and Ed made it and we ordered our pizza. One thing to note - Hi-Tone is first and foremost a bar/concert venue. We ordered at the bar (drinks and food) and there was really no "table service." You've got to expect that going in. Our bartender/server guy was very cordial but not exactly overly helpful. But I get it - it's a bar. So we order our pizza. Talk for a good 20 minutes (not exactly quick but we were chatting so it was ok), and the pizza comes out. I was way too busy chowing down on it to get a pic of it in its beginning form but let me tell you - ridiculously amazing. It was HUGE. A large was originally $14 plus toppings at $2 a pop for a large but we got ours half off so our pizza ended up being something like $8.50. As a pizza lover, I can discern between a good pizza and an ok pizza. This one was good. Overall, I definitely recommend going to half prize pizza night at the Hi-Tone (across from Overton Park on Poplar by the Circle K). If you're really hungry, you could always order your pizza over the phone so it is ready when you come in. I saw some people doing that. We might do that next time. I'm so glad you enjoyed it! If you want a real treat, come check out Sunday brunch from 11-4. The food is incredible, and the most expensive thing on the menu is eggs benedict with a side for $9. $4 Mimosas, Bloody Marys, margaritas.... Can't go wrong! We've talked about going. Sometimes a whole group of us go out to brunch after church. I'll have to set it up for us to go there. I'm all about Mimosas and Jake can't resist a bloody mary.